Shrimp and other shellfish can be part of a healthy diet for both children and adults, according to the U.S. Food and Drug Administration. Shrimp is a good source of high-quality protein and essential vitamins and minerals. Shrimp can contribute to your heart health, and they're low in saturated fat when eaten in a shrimp cocktail. Shrimp can be a good source of omega-3 fatty acids. The body can not produce these important fats -- they must be obtained from food and supplements. Omega-3 fatty acids can reduce your risk of cardiac arrest and high blood pressure, and they can also improve your anti-inflammatory systems. Six pieces of jumbo shrimp in a shrimp cocktail provide about .15 grams of omega-3 fatty acids. The Cleveland Clinic recommends about 5 grams of omega-3 fatty acids per week. 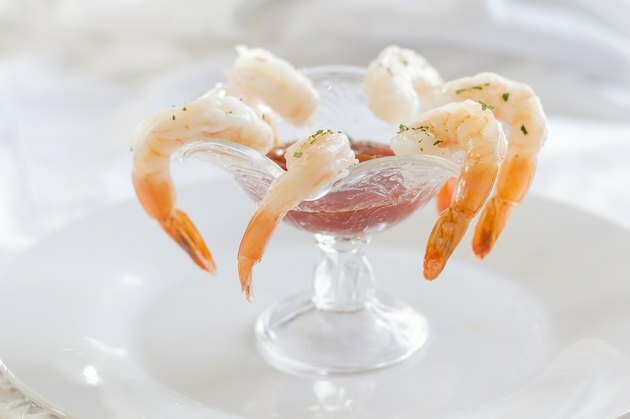 A six-shrimp cocktail dipped in cocktail sauce has about 120 calories, according to Fat Secret. Only 12 of these calories come from fats (primarily polyunsaturated and monosaturated fats). If you skip the cocktail sauce and eat just the shrimp, you'll add only 48 calories to your meal. Two tablespoons of the sauce equal about 20 calories. Cocktail sauce is primarily made from salt and tomatoes. Two tablespoons have about 310 mg of salt and about 7 grams of carbohydrates, according to Fat Secret. The tomatoes provide about 4 percent of your daily vitamin C requirement. Six large pieces of shrimp also have about 9 grams of protein, 60 mg of potassium, 72 mg of cholesterol and 210 mg of sodium. Shrimp can carry toxins and lead and should be purchased from a reputable grocer or fishery, according to the U.S. Food and Drug Administration. To check the freshness of shrimp, smell it -- it should not have a fishy smell. The fleshy part of the shrimp should spring back when you push lightly on it with your finger. The shrimp should be a pearly white when it's cooked sufficiently. Shrimp has more cholesterol than any other seafood, except for salmon. High cholesterol in your blood can lead to heart disease and other coronary conditions, according to the Mayo Clinic.